1. Determine how much water your plants need: Small shrubs need less water than big trees because they have a smaller root zone. A root zone refers to the area in which the feeder roots are most concentrated. It's best if you make sure to wet the entire root zone on each water cycle to ensure you are maintaining the healthiest plants. 2. Determine how deep you should water: As a general rule of thumb, small plants (cacti, annuals, etc.) should be watered to a depth of one foot. Medium-sized plants and shrubs need to be watered to a depth of two feet and large trees and other large plants should be watered down to three feet in the soil. So how do you test how deep you have watered? Get a long screwdriver or soil probe and push the tool down into the soil approximately one hour after watering. You will know if you have not watered enough because the probe will be difficult or impossible to push into dry soil. 3. Determine how wide you should water: The roots that absorb water are located just beneath the outer edge of the plants canopy. This is called the dripline. Water is not absorbed close to the trunks or stems. This means you should place your emitters along the dripline of each plant so that the water spreads down and reaches the entire root zone as it soaks into the soil. 4. Determine how much water each part of your watering system applies: Whether you use a watering hose, bubbler, or drip emitter, it's important to figure out how much water each of these systems is releasing. Remember that if you have more than one emitter on a plant or tree you need to total the output of all emitters. Once you have recorded the total outputs for your plants you can figure out run time for each watering line. 5. Make a worksheet which calculates the run time in hours for each area of your landscape. There are plenty of these worksheets available online or at your local garden supply store. 6. Determine your watering frequency: This can vary by season as the weather changes throughout the year. Run times should stay the same however your watering frequency will change. 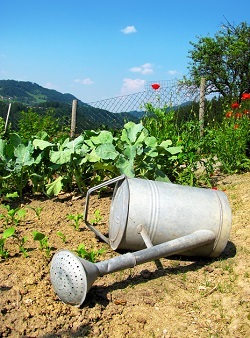 For example, plants can use 3 to 5 times as much water in the hot summer months as they do in the winter. 7. Make sure you are not over or under watering your plants: Signs of overwatering include excessive growth, change in color to yellow or light green, and algae on plants. Signs of under watering include leaves that curl, leaves that turn brown and dry up, and stems or branches that dry out and break.